Lopi Radiant Plus Large Gas Burning Fireplace Insert is perfect for those wanting dependable performance at an affordable price! 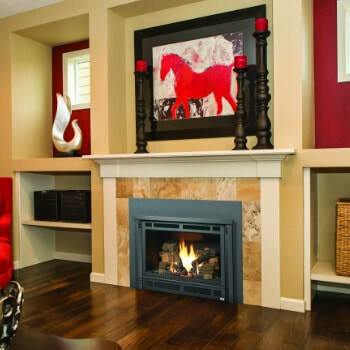 The Radiant Gas Fireplace Insert is an attractive and budget friendly way to keep your home warm. ​This model can even run in the event of a power outage. The Radiant Large insert features heavy duty construction. It is crafted to generate radiant heat plus streamlined natural convection airflow to homes up to 1,650 square feet. The standard Classic Log Set™ and Dancing-Fyre™ burning resemble a real wood fire! This model is available with your choice of a Standing Pilot (MV) and GreenSmart® Basic (IPI) control systems. Choose the version that best suits your heating needs. The Standing Pilot unit is perfect those desiring an easy, reliable heat source that does not need electricity to operate. The GreenSmart® Basic version is a good option for convenience and energy efficiency, as your pilot turns on and off depending on your heating needs. This model comes with an automatic battery backup system to operate even when the power goes out. * Will vary with insulation, floor plan and external temperature. ** Your results may vary based on your vent set up. If the project is outside of South West Montana please visit the Lopi site for dealers that may be near your area. Bare's may only sell these products bought and picked up from our store locations. Please understand we are unable to ship, sell, deliver, install, service or provide warranty for items outside of our area.